Investment grade: We look for preferreds that are trading below (to slightly above) par with investment grade credit ratings and current yields above (or near) 6%. High yield: We look for BB-rated securities or non-rated securities that yield in excess of 7%. We avoided many of the mortgage REIT preferreds, energy preferreds, and shipping preferreds. We just don't see the return for the amount of risk. Qualified Dividends: We look for issues who's dividends qualify for capital gains treatment and again avoid the shipping and energy stocks, many of the names that are trading well above par, and those with yields below 5.50%. 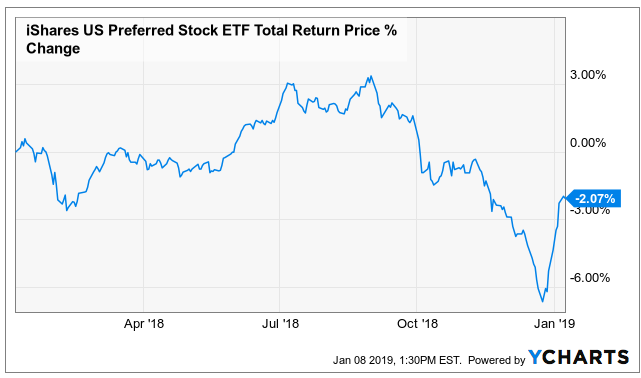 The preferred stock index ETF (PFF) is rebounding sharply as tax loss harvesting is now over. We compared current prices to two months ago when we first issued our monthly report. Let's first look at the preferreds that made the largest absolute price change down since November 7th. Pacific Gas and Electric is likely to have to enter some form of bankruptcy as they are (at least partially) responsible for those California wildfires that killed dozens of people. Apollo Global Management (APO_B): Current yield 6.74%, price $23.63, down 3.2% since early November. BBB+ rated. RenaissanceRE (RNR-E): Current yield of 6.07%, price $23.56, down 6.0% from November. BBB rated. Oaktree Capital (OAK-A): Current yield of 6.79%, price of $24.40, down 2.2% since November. BBB rated. National Storage Affiliates (NSA-A): Current yield is 6.41%, price is $23.40 down 4.1% since November. Pennsylvania RE (PEI-B): This is a highly speculative position that is a total return play (keep position size capped at 1%). Colorado Wealth Management speaks highly of this position and is pounding the table to buy. The current yield is now 9.63% with a yield to call of 23.4%. The common has been rallying lately and yields almost 14% (clearly positioned for a dividend cut). That would be beneficial for preferred stock holders. National General Holdings (NGHCP): The shares are down over 7% on price over the last two months and now have a current yield of 8.13% with a yield to call of 22.64%. This is another speculative name but not nearly as speculative as PEI-B. The common shares trade at $24, with the company earning $1.34 over the last twelve months- not even close to a level that would indicate that level of distress in the preferreds. Prologis (OTCQB:PLDGP): This is a $50 par issue that is current trading north of par at $59. That is down 4.2% in the last 60 days. Current yield is 7.19%. The common trades at $61- clearly an indication of health with $2.45 EPS ttm. The preferreds are not callable until 2026 so paying a premium today is not of a concern. Gladstone Investment 6.375% (GAINL): One of the only term preferreds that moved to any degree during the last two months falling 1.94%. The yield is 6.45% and the price is now below par. The earliest call date isn't until August 2021. Individual preferreds look extremely compelling to add some high quality 6%-7% yielding positions to the portfolio. Our target right now is about 15% in these securities, spread across at least 5-10 positions depending on quality. These securities appear nicely oversold, especially on the investment grade sign but there are pockets of deep value in the high yield side as well. Investors can use the above tables to look at which preferreds are down in the last couple of months possibly providing a good entry opportunity.